I’ve been having some serious skin issues the past few years and it’s sent me on a search for aluminum-free deodorants that actually work. I don’t necessarily need to switch over to a natural deodorant but I figure it can’t hurt. I definitely have some criteria if I’m going to be spending more money though (natural deodorant is notoriously more expensive than traditional ones). It has to smell good, or at least keep me from smelling bad, it needs to last at least a couple hours and it needs to not cause more skin issues for me. I put three natural deodorants to the test and here’s how it all worked out. 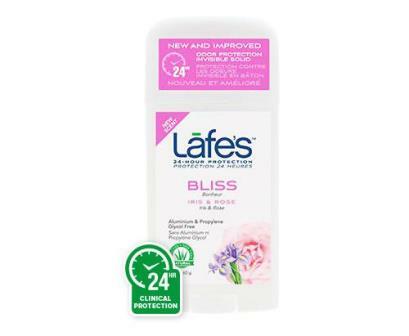 I didn’t get to choose the Lafe’s scent that I used and to be honest, it’s probably throwing off my opinion.While I love most rose products, this one just smells like old lady to me and while the scent lasts a really long time, the actual deodorant doesn’t hold up nearly as well. The texture and stick are nice enough that I would definitely try another scent and see if I like it better. I’ve loved Tarte makeup for years but I haven’t tried a ton of their skin care. When I heard they were bringing out a natural deodorant, I had to try it. It smells incredible but I wish the scent lasted a little longer. Some days I can still smell it after a couple hours and some days it disappears on me almost immediately. The star of this deodorant is the formula. It takes a second to dry down but once it does, it keeps me dry and stink free for hours. I still need to reapply on sweatier days but it’s definitely cute enough to keep in my purse. I’ve never used a pot deodorant before and while I did have a couple of the Schmidt stick versions, this one interested me more. The rose scent in this one is much more to my liking but I did have a couple issues with it. This is the only deodorant of the three that’s baking soda based and my skin does not react well to it. While some people get rashes, I find that after a few hours, the scent turned on me and really became gross. To the point that I had to wash it off and put something else on. That said, it was much easier to apply than I expected and only ran into issues if I wanted to reapply and didn’t have a counter handy but I would definitely use this if they made it in their sensitive skin formula which doesn’t have baking soda in it. This could’ve been the winner for me, but my skin didn’t agree. 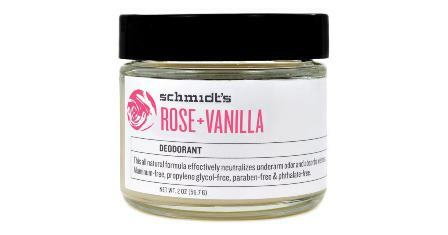 I had issues with the scents of both the Lafe’s and Schmidt’s deodorants for different reasons but the formulas themselves were decent. I just need to look into other options from both those companies. Tarte was the clear winner for me but at $18 CAD, it’s a little pricey. I’ll see how long one stick lasts and then decide if I’ll use it on a regular basis but I’m really liking it right now, so I think that it’s pretty likely I will. It’s nice that we have so many more options for natural deodorant and if there’s another one you think we should try, let us know.